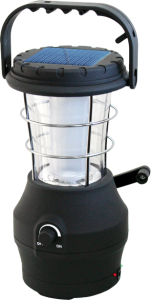 The POWERplus Hippo is a big camping lantern with 24 ultrabright white LEDs. The Hippo can be charged by dynamo (integrated in bottom), solar (integrated on top), AC USB charger and by USB (USB AC charger and USB charging cable included). The Hippo comes with an USB-out port, so you can charge your mobile phone as the Hippo can act as a powerbank. The light brightness of the Hippo can be set variable and besides the internal 2.300 mAh battery, the Hippo has an extra battery compartment so it can run on 3 drycell AAA batteries as well.